The importance of this live album from The Jam has lessened over the years. 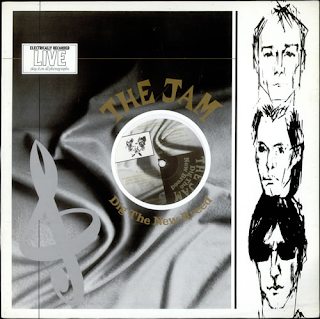 In 1982 when it was released it was received like the Holy Grail because there was simply no other Jam live material available and we craved it. Now, there is the fantastic “Fire And Skill” six gig box set; the “Jam At The BBC” live sessions; various live gig extras as part of the “deluxe” remaster series and the “Live Jam” release which plays like a full live set, even though it might not be one. “Dig The New Breed”, however, is a 14 song collection derived from live gigs between 1977 and 1982. The quality is variable but we were grateful at the time for anything that captured that feeling of being at a Jam gig. I was lucky enough to be at ten of them. It would have made more sense at the time to have released a full gig, but this was how the band chose to reward their legions of loyal fans. At the time, nobody complained. They really didn’t. Everything was lapped up. I remember at the time, though, being slightly underwhelmed by the album, feeling that indeed it did not reflect the true thrill of being at a Jam gig and that the tracks chosen were not the best either. 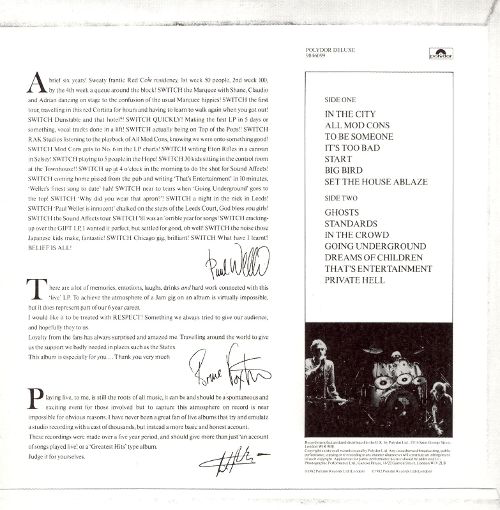 I would have liked to have seen “Tube Station”, “Strange Town” or “Wardour Street” on there, along with maybe “Life From A Window” or “Here Comes The Weekend” from the earlier days. As it is, is it good to hear “In The City”, “To Be Someone” and “It’s Too Bad”. “Big Bird” is an interesting inclusion but sonically it is a mess and not a patch on the original. The take of “Going Underground” on here is somewhat clumsy too.